The incredible claim was made by UFO-hunter Scott C Waring who runs the blog UFO Sightings Daily. In a bizarre post on his website, the conspiracy theorist showed archival photos of what he thinks is an entire alien city. The supposed extraterrestrial structure, in Mr Waring’s estimate, measures up to 20-miles-across (32km). The UFO expert even likened some of its features to structures here on Earth, praising its complexity and beauty. Mr Waring said: “Earlier I talked about alien structures and their colours. Here is a white reflective structure. “The structure doesn’t look white because I had to add shadow to get it to become visible, otherwise it would just be a shiny area. The UFO enthusiast then said there are many more white structures connected to the supposed alien tower. The NASA photo, which Mr Waring has scrupulously analysed, was snapped by one of the space agency’s Lunar Orbiters. NASA’s Lunar Orbiter programme saw a series of spacecraft fly to the Moon to photograph the orb's surface in preparation for the Apollo 11 landing. The incredible probes took snapshots of nine potential landing sites for the historic NASA mission as well as 11 additional sites on the far side of the Moon. One of the photos, which was snapped on August 23, 1966, was the very first photo of the Moon taken from up-close. But if Mr Waring is to be believed, the archival snapshots hold a much more interesting plethora of information than just potential landing sites. And yet, the UFO expert admitted he had to edit the photo to bring out the alien structures allegedly hidden within. He said: “Now how do I know this is a white reflective structure? “Easy, just look at the original photo and you will see that these white structures sit in the centre of a dark shade area. “Yet, they reflect light either from itself or from far away sources. But did Mr Waring truly discover an entire alien colony on the surface of the Moon? The more likely scenario is the conspiracist fell for the effects of a psychological trick known as pareidolia. 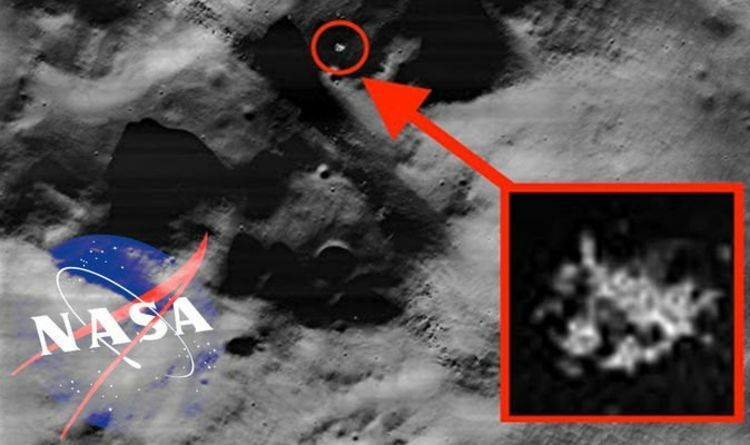 Pareidolia causes people to see shapes, faces and patterns where they do not exist, which often leads UFO-hunters to spot aliens in pictures of the Moon or Mars.